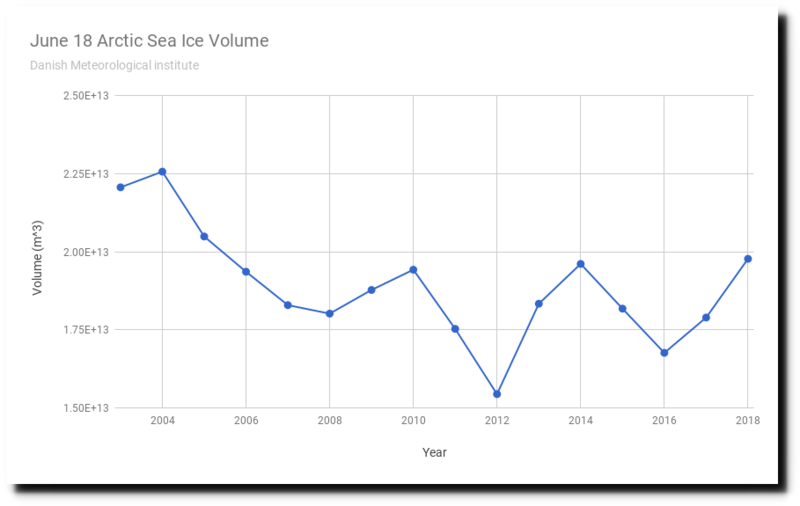 Arctic sea ice volume continues as the highest in 13 years, and is melting the slowest on record. 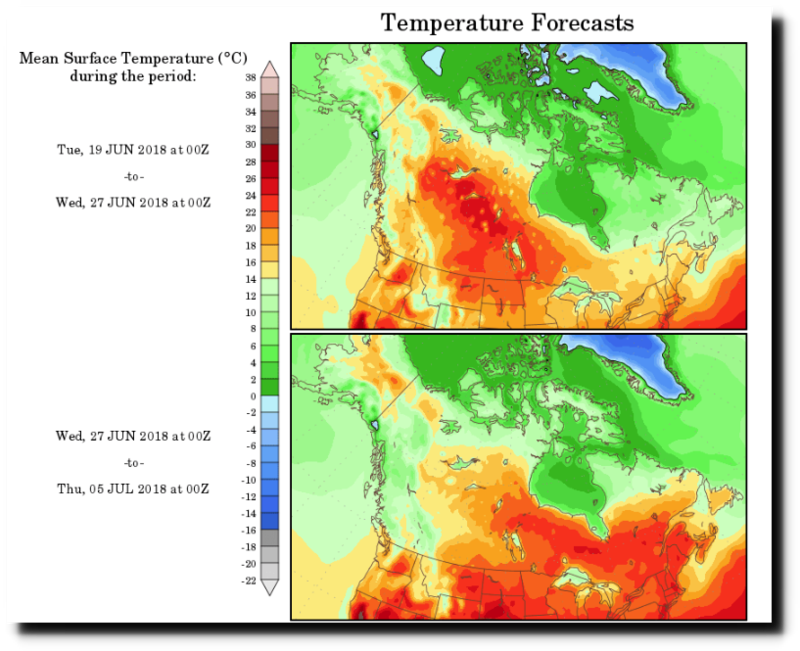 With cold weather forecast past July 4th, the odds of a big melt this year are close to zero. 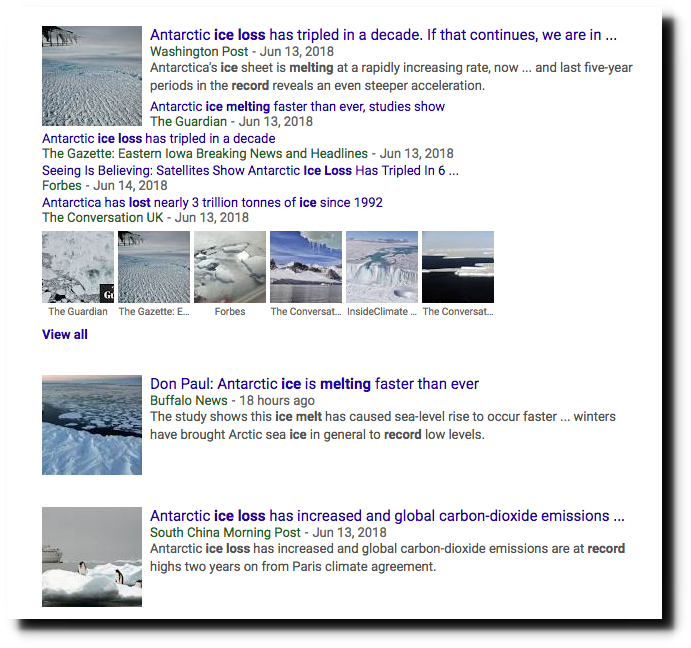 With their Arctic scam falling apart, climate alarmists have returned to their Antarctic scam – claiming that Antarctica is melting in the middle of the Antarctic winter. Climate alarmism is the most pathetic clown show on earth. Today there are crying Innuit children in the Arctic. CO2 in their breath is reportedly at high levels. This is among the greatest evidence yet for Global Warming. A National Geographic crew is banging on the front door trying to get in and film the crying children. Tears are rolling down their cheeks. The whole Arctic is screaming. It’s a pandemonium. It drives the Innuit parents crazy. Heartbreaking, his mother should have aborted him. Nat Geo are one of the worst for spreading this scam. Luckily I don’t need to watch their channel often. According to a new paper published in the Journal of Geophysical Research, the observed mean thickness of the sea ice in the region north of (Arctic) Svalbard was substantially thinner (0.94 m) in 1955 than it has been in recent years (~1.6 m, 2015/2017). Thanks for posting, Tony. 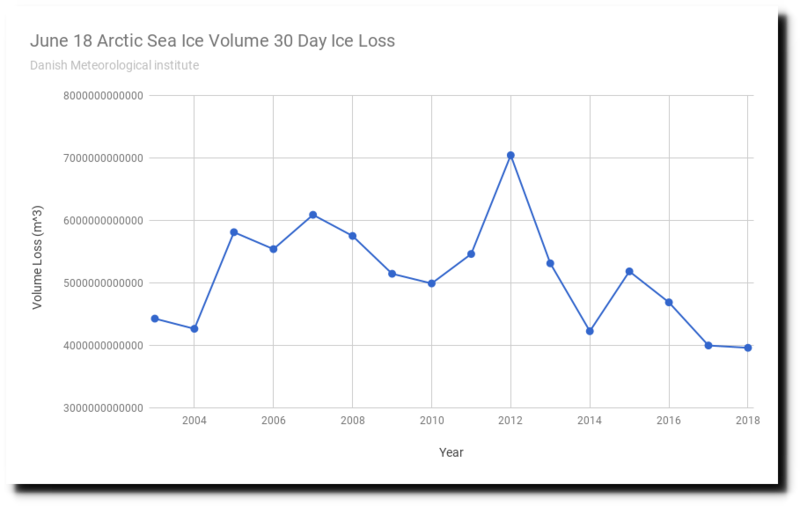 Looking at your chart of yeaterday’s sea ice volumes compared to prior years, there is an interesting correspondence and pattern of the values every 4 years., beginning with 2006. The pattern is 2 years decline, 2 years recovery to just about the same value as 2006, putting 2006, 1010, 2014 and this year at just about the same level for the day. The values for both 2014 and 2018 are getting closer day, by day, with 2014 declining at a slightly lower rate than this year. Both of them ar narrowing the gap with the next highest year, 2005, which DMI does not show on its graph. 2018 and 2014 are continuing to rise above the average for the day, and 2005 is declining toward the average. maybe only 3-4 days until 2018 crosses above 2005 at this rate, I’d say. I don’t think it will be that fast, based on the recent gap-close rate. The next 4-5 days should tell. And, G55, why not write a bot that will go do the download and daily value select for you? IMO, the more eyes on the data, the better. Is there a particular metric you are not seeing in which you have interest? I don’t write everything I am calculating here every day. The South China Post relates the Antarctic melt to CO2. Does that mean that carbon dioxide eats the ice from the surface down? A super ablation in a frozen world? No sign of accelerated melting. Next time some expert points at the open sea and talks about albedo he must be confrontated by some open-minded reporter, if there are any. Must be a slow news day every day for reporters to resort to dragging out this old chestnut of a lie. Maybe that reporter and “blowtorch” Reggie should go for a row up there. I can’t wait for the next moron to try “sailing” to the North Pole and get rescued a day into the trip. I think the point of the article is that the USA is ” missing the boat” in terms of commerce in the arctic. The Russians are investing in massive ice-breakers. They could care less if the ice is thinner if they have ships this can plow through sea-ice that is ten feet thick. I said a similar thing to my wife a week or so ago: The Arctic is rebounding with ice coverage. The scammers are trying to redirect the narrative to the Antarctic now. I note that the sea ice around Svalbard is now lowest ever -lower than at September minimums. This is not a recovery or any sign the ice is not in trouble. You are done like dinner Griff. Time to move on the LGTBWTF movement. Not even close, you genocidal New Earther! You still think the ice is in trouble? Remember, the ice does not care what you think. One of your heroes, David Barber said 10 years ago that the ice is “rotten”. It sure looks rotted and fermented now. I’m anxious to get home tonight. I must talk to the pile of rocks and dirt behind our house. I don’t know what I’d do if they are in trouble. There are huge parts of dirt and rocks that are that way-transsibiria for example. Rotten ice visited me last night and it must be quite angry because it shredded quite a few leaves, especially on zucchini plants. Thankfully it left sometime later in the evening. I did not stay up to see it go. can you consider that there is somthing really wrong with your preferred science? is very likely somewhere else as result of a bad climate mix. MASIE extent is now above.. In the East Siberian Sea, it is above 2007, 2009, 2011, 2014, 2017. Kara Sea extent is still above every other year. Canadian Archipelago above every year except 2012, and 2013. Judging from DMI volume graph, we have roughly 4500 km3 more sea-ice this year than last year. Hmm. How much ice is a single cubic kilometer? And is it as large as a blockhead like Griff? It is STILL in the top 5-10% of extents of the last 10,000 years. In 1974, water north of Svalbard was considerably open. Good point. Also in 1817, when whalers marveled how far north they could venture, because a gigantic amount of sea-ice got dumped down into the Atlantic. 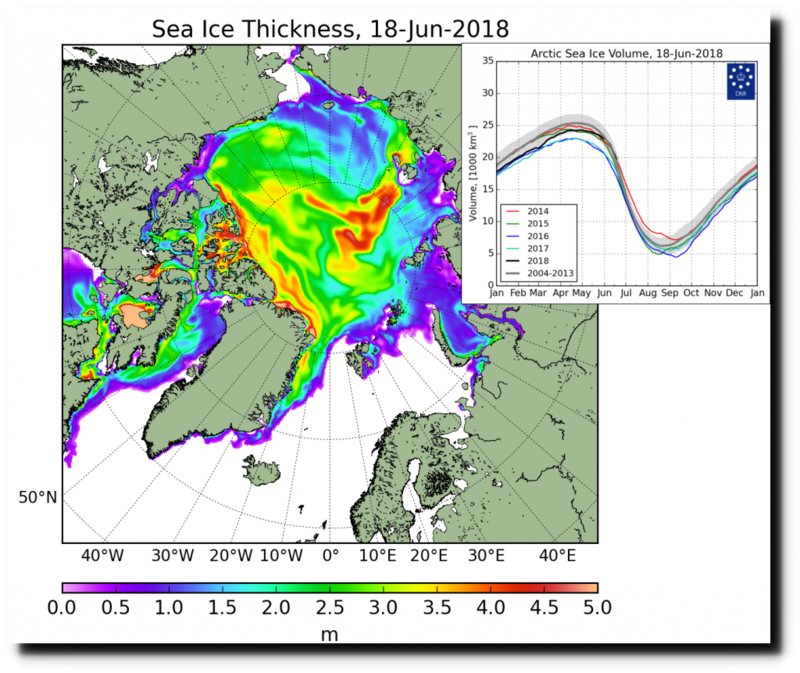 The Arctic ice is just fine. Geez Griff, sea ice is absolutely useless to everything. Nothing eats it or benefits from it. Sure it can be used for “fishing” off by a very few animals, but land is far more suitable for that. The only idiots that find sea ice useful are the fools that need to get rescued off it after nearly freezing to death just days into their “proof of global warming hike/sail/row to the North Pole”, Nat Geo photographers salivating over smallish icebergs, and you to blubber about every dribbling icicle. Ever thought of going up there yourself and proving what you say? Remember, going by the failure rate of the idiots before you, I think you have 3 chances of achieving anything: buckleys, f*ckall and none. Also ice thickness is very thick this year on the eastern side next to Siberia? Runs counter to your argument Griff. Keep cherry-picking WEATHER affected areas, little mind. ! How can that be? And if they are using that extent info to calculate the volume ….